Having played so many board games I have encountered a lot of different themes. A lot of board/card game themes tend to blend together but you will occasionally run into an interesting theme. The theme was actually the thing that initially intrigued me about RESISTOR_. The idea of playing as a supercomputer trying to hack the other player sounded like a really interesting theme for a card game. RESISTOR_ is an interesting combination of several different mechanics which creates a solid but unspectacular card game. Remove the action, mainframe and lock down cards from the deck. Shuffle the rest of the cards. Draw seven cards and place them in a line so the chips connect. 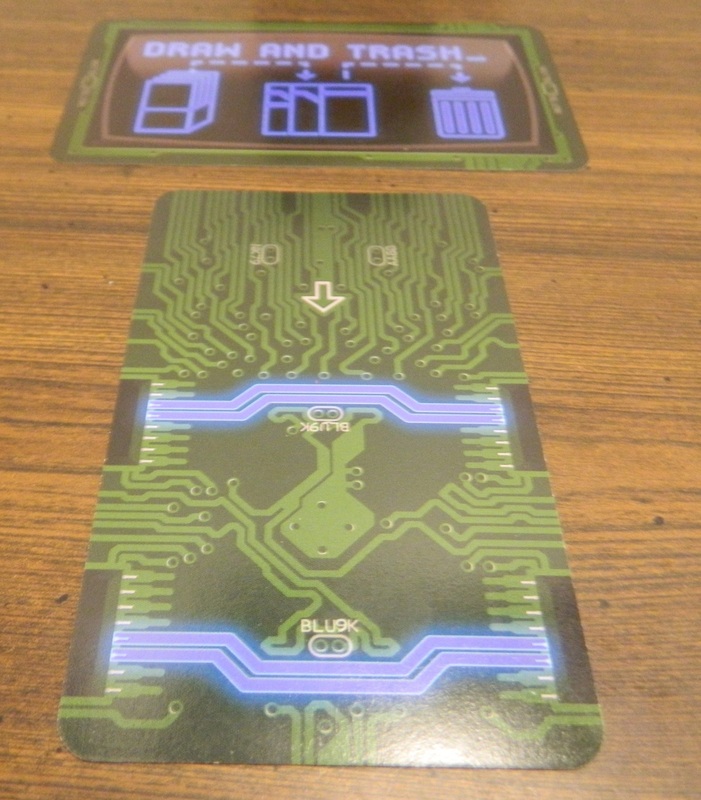 If any resistor card was played face up to the table it is returned to the deck and a new card is drawn. The rest of the shuffled cards are put into the holding box. 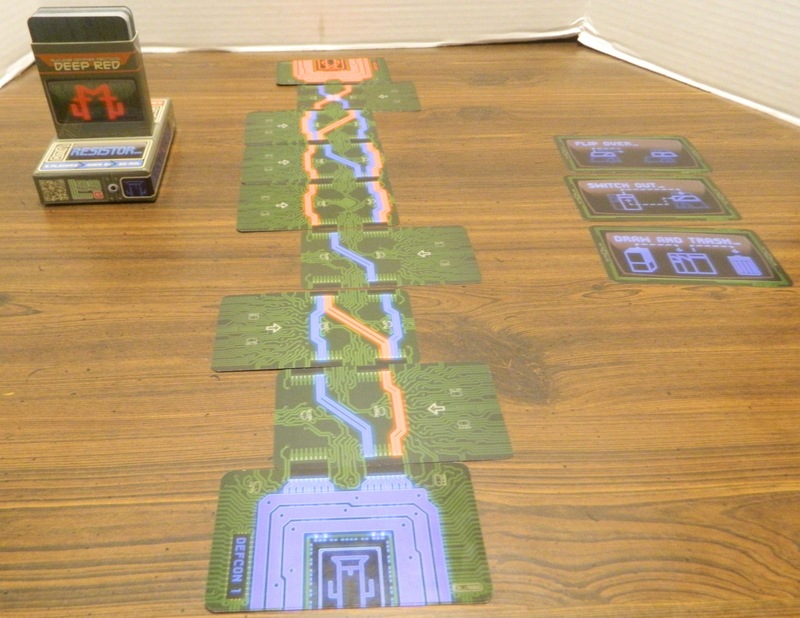 The action cards are set to the side of the cards laid out on the table. 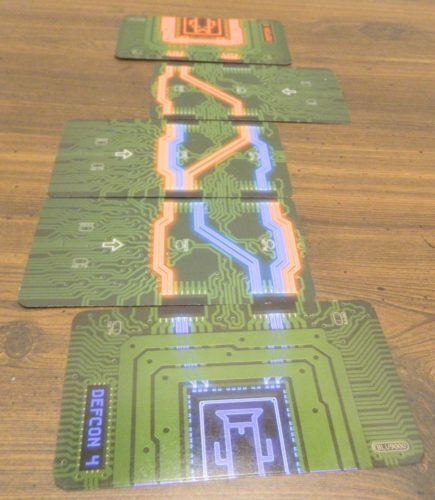 Both players connect their Defcon 1 mainframe card to their side of the cards on the table. Each player draws two cards but they can only look at the side of the card that is facing them. The player with the least cards on the table that have their color on it gets to go first. On a player’s turn they have three actions that they will perform. A player can perform the actions in any order but can only perform each action once per turn. When a player performs an action they flip over the corresponding action card to indicate that they have performed that action. Flip Over: With the flip over action the player can choose one of the cards on the table and flip it to the other side. When flipping over the card you must flip it in the direction of the arrow on the card. For the flip over action the player has decided to flip over the second card from the top. They will flip the card to the left. Draw and Trash: Draw a card from the deck and look at the side of the card that is facing you. You can choose to either add the card to your own hand or add it to the other player’s hand. You then will get to choose one card to discard from whichever player got the new card. When a card is discarded both players can look at both sides of the card. 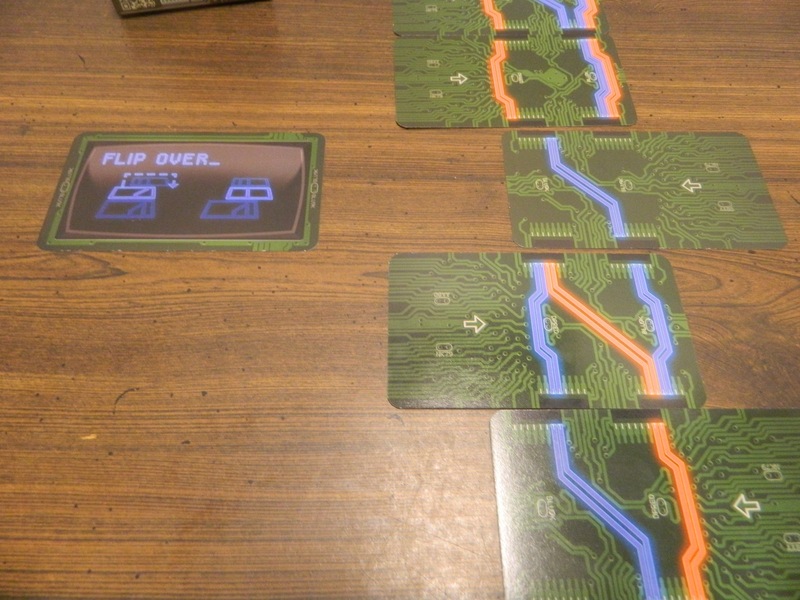 If a resistor card is discarded the other player has to immediately flip over one of the cards on the table. Switch Out: Remove one of the cards from the table and add it to your own hand or the other player’s hand. The card is held so the current player sees the side that was face up. You then take one card from the hand that you gave the card to and place it in the spot that you took the card from. You must place the side of the card that was facing you face up on the table but you can choose the orientation of the card. The blue player has decided to remove the second card from the top and replace it with the card to the right. 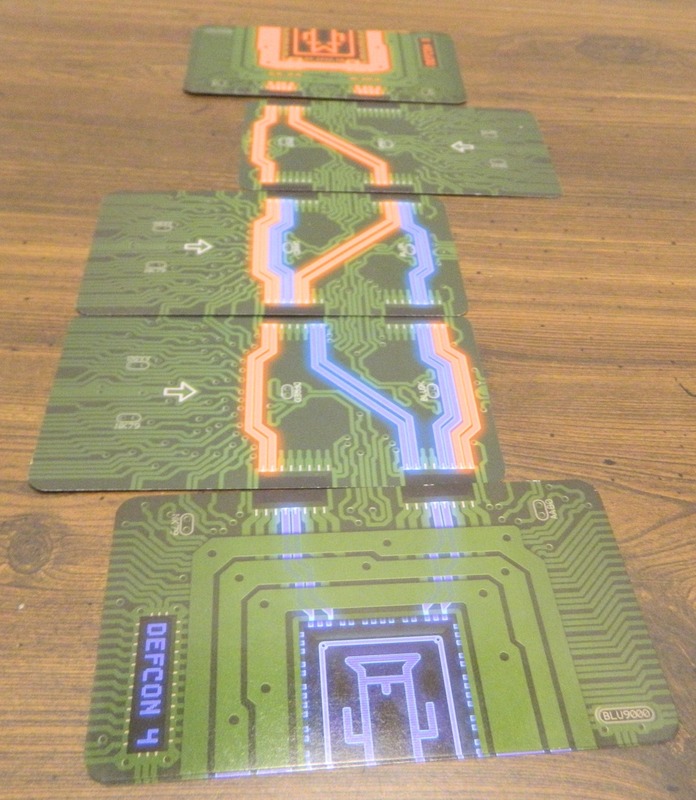 If either player has an uninterrupted line of their color that runs from the resistor to their mainframe, they get to lower their defcon level by one. If the player’s Defcon is already one, the player does nothing. Any card that has at least one connection to the resistor is flipped to the other side. The resistor card is removed from the board and is discarded. All of the cards are pushed together to fill in the gap from the removed resistor card. A resistor card has been revealed. The red player has a path back to their mainframe so they can reduce their defcon level by one. The blue player doesn’t get to reduce their defcon level since they don’t have a path back to their mainframe. The resistor card will be discarded and all of the cards above the resistor card will be flipped over. Finally all of the cards will be pushed together to fill in the gap. After a player has performed all three actions, both players look to see if they have an uninterrupted line (of their color) from their mainframe to the other player’s mainframe. If a player has an uninterrupted line, the other player raises their Defcon level by one. If a player has two uninterrupted lines that never cross, the other player increases their Defcon level by two. Both players can score after each players’ turn. The blue player has created a path from their mainframe to the other player’s mainframe. The red player’s defcon level will be raised by one. After any potential scoring is completed, play passes to the other player. RESISTOR_ can end in two ways. If one player has reached Defcon 4 and the other player scores another point, they win the game. The blue player is currently at defcon 4. The red player has scored another point so they have won the game. If the board is ever shortened to one card or the deck runs out of cards, the game ends immediately. Players compare their Defcon levels. Whichever player has a lower Defcon level wins the game. If the players are tied, neither player wins the game. I will admit that it is kind of hard to classify what type of game RESISTOR_ is since it takes mechanics from quite a few other genres. While I wouldn’t say that any of the mechanics are highly original, they create an interesting blend of mechanics that I haven’t seen in a lot of other games. 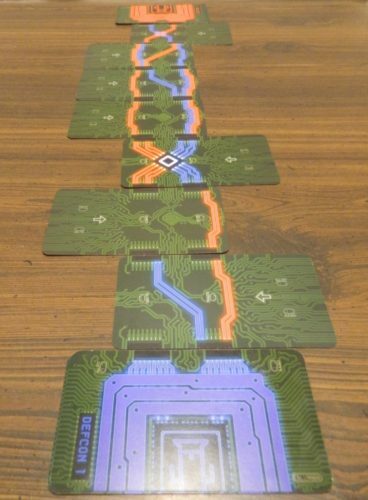 Basically the goal of RESISTOR_ is to create a path of your color that runs from your computer through all of the cards to the other player’s computer. This is done by the players performing various actions in order to change up the cards on the table. The game creates a tug of war feeling as the players trade off making some progress. 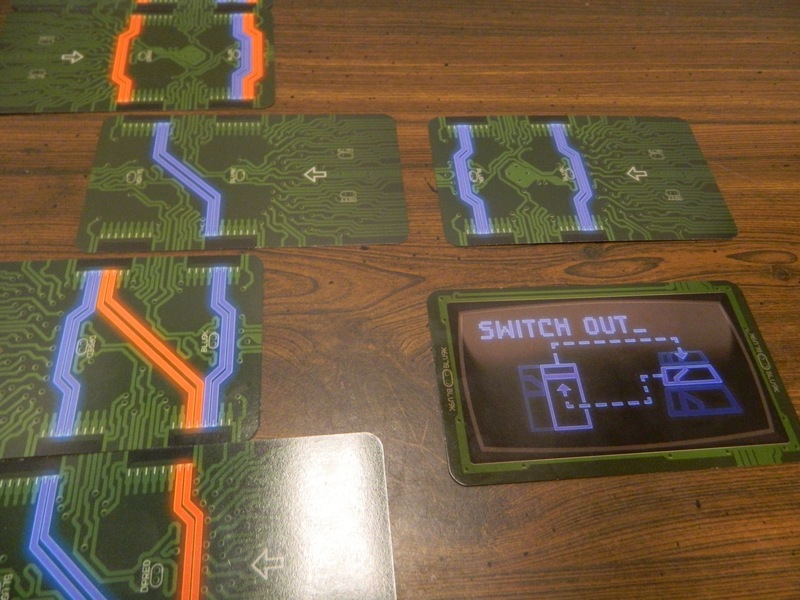 I would say the main mechanic in RESISTOR_ is a tile laying mechanic even though the game uses cards instead of tiles. In order to connect your computer to the other computer you need to make a continuous path between the two computers. This requires you to play and manipulate the cards on the table in order to get your wires to connect to one another. Placement of the cards is crucial since you might have the right cards out on the table but if they are arranged in the wrong way you won’t be able to complete your path. This mechanic is fun but I wouldn’t say that it is drastically different than a lot of tile laying games. While the mechanic is used in other games, I like the idea of the double sided cards. With the double sided cards each player will have some information about their own cards along with some information about their opponent’s cards. Neither player will have a full picture of all of the cards in play though. I really like the idea of having information about the other player’s hand that they don’t know. You might know that the other player has a really good or bad card and can then either play that card to help yourself or discard it so they can’t play it. After the “tile laying” mechanic I would say the most important mechanic is the memory mechanic. RESISTOR_ is not a traditional memory game but a good memory could really help you in the game. Knowing what is on the side of a card that you can’t see can really help you. You can still win without a good memory but a good memory can really help you. Remembering exactly what is on the other side of a card though is going to be quite difficult. You might be able to remember if the other side of a card is good or bad for you but you likely won’t remember all of the connections. Add in having to remember many different cards that are regularly swapped out and flipped over. The best most people will be able to do is have an educated guess of what is on the other side of the card. If you can somehow remember both sides of the cards though you will have a considerable advantage in the game. One of the more unique mechanics in RESISTOR_ is the idea of resistor cards. The resistors are interesting since they could drastically change the game when they show up. If a player can make a path from the resistor to their own computer they can lower their Defcon level by one which could be huge in the game. A player could also end having quite a bit of their path ruined because the cards are flipped over due to being connected to the resistor. A resistor showing up at the right time could really shift the course of a game. The problem with the resistors is that based on my experience they don’t have that big of an impact on RESISTOR_. Unless we were just unlucky they don’t seem to show up often in the game. 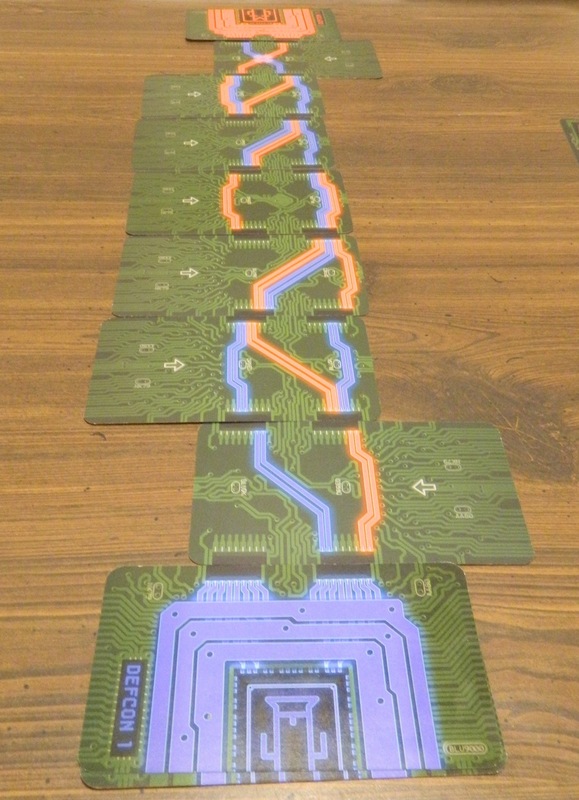 In one game we played only one resistor came up in the entire game. That resistor didn’t even connect to any cards so it had no impact on the game. On the strategy spectrum I would say that RESISTOR_ is a light to moderate strategy game. Your decisions in the game can impact your fate in the game. A lot of your decisions will be pretty obvious but there are opportunities to make decisions that could have a drastic impact on the game. At the same time though there is quite a bit of reliance on luck to be successful. If you draw the right cards and/or the right card get put out on the table, you will have an advantage over the other player. 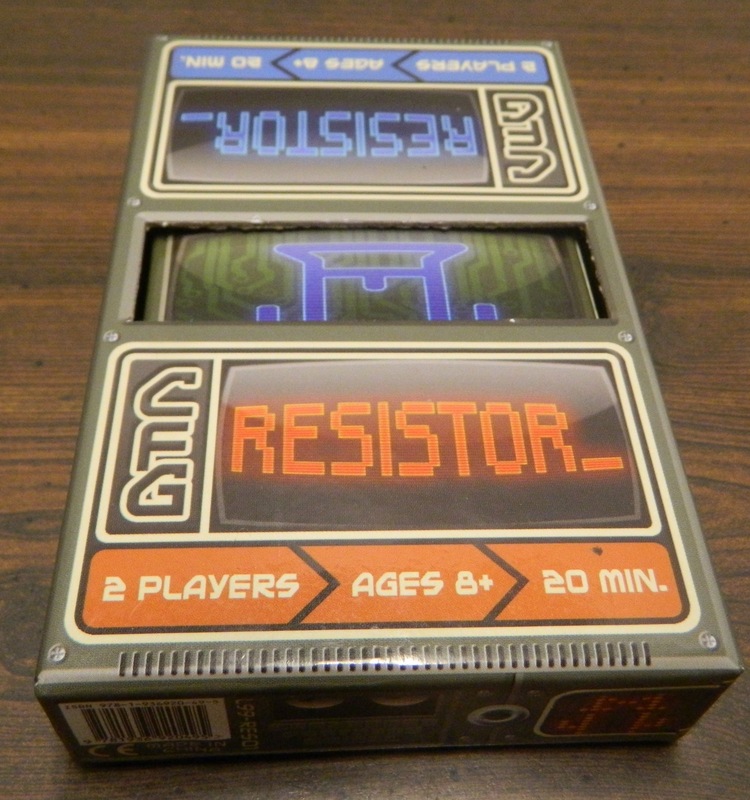 While RESISTOR_ will probably work better with older children and adults, it is actually pretty easy to learn and play. I would guess that it would take most people five to ten minutes to learn the game. The mechanics for the most part are pretty straightforward. Players should be able to pick up the game’s mechanics pretty quickly but it may take a game or two for a player to really start understanding the game’s strategy. Players shouldn’t have trouble playing the game but a more experienced player will likely win most games. One thing most board games are guilty of is underestimating how much time the game takes to play. When a game’s box says that it will 20 minutes, it usually means that the game will take at least 20-30 minutes. I have to say that RESISTOR_ has probably overestimated how long it takes to play. I would estimate that most games should only take 10-15 minutes to complete. Ten to fifteen minutes is the perfect length for RESISTOR_ since I think the game would have started to drag if they lasted 20-30 minutes. When I first saw RESISTOR_ I was really intrigued by the theme. The idea of playing as a supercomputer trying to destroy the other supercomputer is a unique theme for a card game. This theme really interested me being a fan of sci-fi. While the game does a pretty good job with the theme, it just doesn’t play a big role in the game itself. The theme doesn’t impact the gameplay as many other themes could have been applied to the game and the game would have played the same. The biggest issue I had with RESISTOR_ is the fact that I feel it has a leader problem. It seems that if one player gets out to an early lead they will likely cruise to the victory. I think this is mostly due to the fact that once a player has a path to the other side of the board it is hard to get rid of that path. At max a player will be able to get rid of two of the player’s connections. This makes it not that difficult for the player to reestablish the connection on their next turn. I can see the occasional close game but I think a lot of games of RESISTOR_ will end in a blowout. This usually would be a big issue for a game but thankfully RESISTOR_ is quite short. If a player ends up winning in a blowout the game only lasted 10-15 minutes instead of 30+ minutes. You can then play a new game and both players are once again on an equal footing. I would have preferred that the game had closer finishes but thankfully games don’t take too long. Component wise I would say RESISTOR_ is pretty solid. The card quality is fine with the cards being more of a tarot card size than typical playing cards. The artwork is a little basic but works pretty well for the game. At first I didn’t know why there was a hole in the top of the box but it turns out that it works well as a place to stick the card holder so it doesn’t tip over during the game. The components are not amazing but are pretty good for a game that didn’t retail for that much when it was first released. Overall I found RESISTOR_ to be a solid but unspectacular game. I had fun with RESISTOR_. The game is quite easy to pick up and play with most games only taking 10-15 minutes. The game has a good blend of different mechanics. While the game relies a little too much on luck, there is still a decent amount of strategy to the game. The biggest problem that I had with RESISTOR_ is that the game seems to have a leader problem. When a player gains a lead in the game it is really hard to catch up which means a lot of games will end in blowouts. 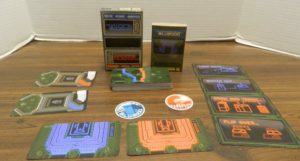 If after reading the “How to Play” section you didn’t really care for RESISTOR_’s premise I would probably recommend passing. If the game’s idea sounds interesting though I would recommend picking up the game if you can get a good deal on it. An interesting blend of mechanics. Pretty easy and fast to play. It is really hard to catch up to a player that gets out to an early lead.